Shanshan and I met some friends (visiting from Malaysia) at one of Beijing’s many upscale malls for dinner last Sunday. 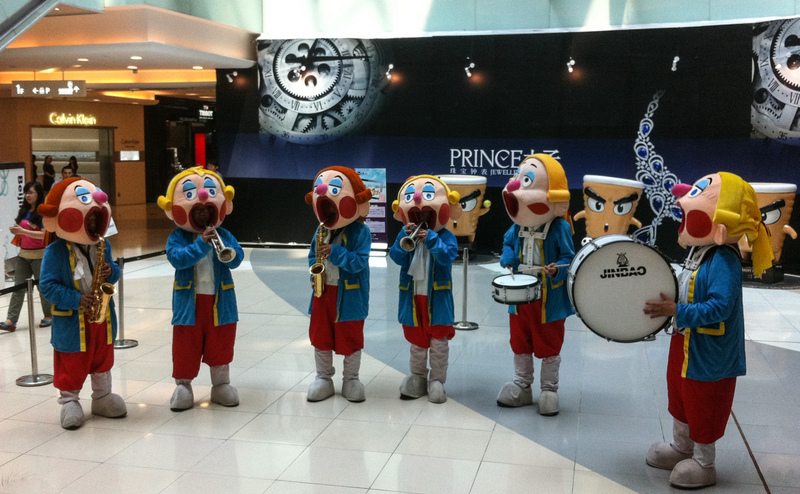 As we entered the mall, we were greeted by these folks. Given that it was only a few days after July 4th, I’m thinking that their costumes were somehow related, but I’m not really sure. I do know that they were bad. Really bad. Banging-out a very loud and unrecognizable tune. I found it fascinating, and wanted to stay and take photos, but Shanshan couldn’t stand the racket and insisted that we go. And we did. Unfortunately, the band did as well… following us playing that classic marching song, “Jingle Bells”. Loudly. Badly. And the band plays on. These people do not look real!! i’d say they were a variation on george washington conflated with the 7 dwarves, but there are only 6. i can understand your fascination. Yet again you bring a smile to my face. Thanks!